In this article, we will be addressing coat maintenance and there are other articles on eye cleaning, nails, teeth care, ear cleaning, and bathing. In caring for the coat of a Persian, you need the right tools. Please do not ever use a brush when trying to remove mats or in the daily "brushing". A brush will not get all the way down to the root of the coat and you will end up with a matted cat. 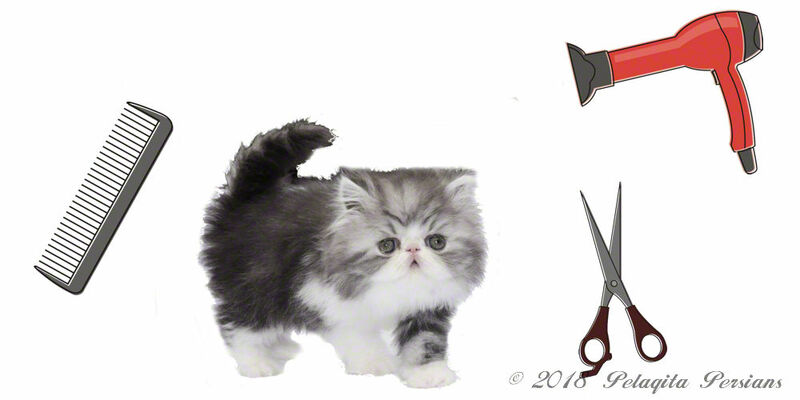 The correct tool for maintaining the coat of a Persian is a comb. We use and recommend the Buttercomb by Chris Christensen. We use the #014 Buttercomb (4 1/2" Styling comb all coarse). Due to its wide spaced teeth and the length of the individual teeth, it will easily reach to the skin of the Persian cat and remove the dead hair and get any mats you might have missed in a daily combing. Another comb we use and recommend is an anti-static medium comb. The comb we use and recommend is a Chris Christensen #006 Face Comb. This little comb is great around the face, and the legs and feet. Remember to use the Chris Christensen #014 Styling Comb first, follow that with the anti-static medium comb and finish with the face comb. Persian cats need to be combed daily to remove dead hair and prevent mats. Problem areas are: behind the ears, under the chin, the stomach area, and underneath each arm. These areas will mat more quickly than other areas of the coat. If you comb the whole coat daily (spending a bit more time in the problem areas) your cat will never have a mat! Never try to comb out a mat, rather use the comb to lift the mat and then with your fingers gently pull the mat apart. If you try to comb out a mat it can pull on the cat's skin, possibly pull out more hair than is matted making combing a nightmare that your cat will want to avoid. When we are finished with grooming, we always offer our cat a treat for being such a patient and well-mannered kitty. With the proper tools and daily maintenance of your Persian cat, it will enjoy its grooming time, never suffer from mats and have a great coat.